January 28, 2012 - A new series of tests on the engine that will help carry humans to deep space will begin next week at NASA’s Stennis Space Center in southern Mississippi. The tests on the J-2X engine bring NASA one step closer to the first human-rated liquid oxygen and liquid hydrogen rocket engine to be developed in 40 years. Tests will focus on the powerpack for the J-2X. This highly efficient and versatile advanced rocket engine is being designed to power the upper stage of NASA's Space Launch System, a new heavy-lift launch vehicle capable of missions beyond low-Earth orbit. The powerpack comprises components on the top portion of the engine, including the gas generator, oxygen and fuel turbopumps, and related ducts and valves that bring the propellants together to create combustion and generate thrust. "The J-2X upper stage engine is vital to achieving the full launch capability of the heavy-lift Space Launch System," said William Gerstenmaier, NASA's associate administrator for the Human Exploration and Operations Mission Directorate. "The testing today will help insure that a key propulsion element is ready to support exploration across the solar system." About a dozen powerpack tests of varying lengths are slated now through summer at Stennis’ A-1 Test Stand. By separating the engine components -- the thrust chamber assembly, including the main combustion chamber, main injector and nozzle -- engineers can more easily push the various components to operate over a wide range of conditions to ensure the parts’ integrity, demonstrate the safety margin and better understand how the turbopumps operate. "By varying the pressures, temperatures and flow rates, the powerpack test series will evaluate the full range of operating conditions of the engine components," said Tom Byrd, J-2X engine lead in the SLS Liquid Engines Office at NASA's Marshall Space Flight Center in Huntsville, Ala. "This will enable us to verify the components' design and validate our analytical models against performance data, as well as ensure structural stability and verify the combustion stability of the gas generator." This is the second powerpack test series for J-2X. 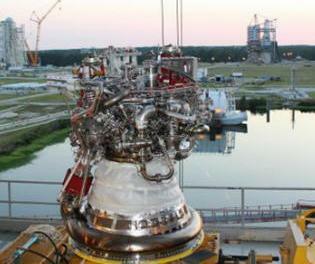 The powerpack 1A was tested in 2008 with J-2S engine turbomachinery originally developed for the Apollo Program. Engineers tested these heritage components to obtain data to help them modify the design of the turbomachinery to meet the higher performance requirements of the J-2X engine. "The test engineers on the A-1 test team are excited and ready to begin another phase of testing which will provide critical data in support of the Space Launch System," said Gary Benton, J-2X engine testing project manager at Stennis. J-2X is being developed for Marshall by Pratt & Whitney Rocketdyne of Canoga Park, Calif.